Fleming Island, Florida – Key of Life, a mobile application for patients to keep medical records in one place, has officially launched in the Apple Store and Google Play Store. Key of Life allows patients to take control of their healthcare by creating a single, digital location to store all information regarding medications, lab results, health history, radiology, and more, that can be shared with anyone they choose. Key Of Life’s entrance into the app world dramatically improves the healthcare industry by enabling users to quickly access all medical records for a smooth transaction to their healthcare providers. Prior to Key of Life, patients would need to fax, email, or provide physical copies of their medical records and charts from different doctors to the corresponding physician’s office. 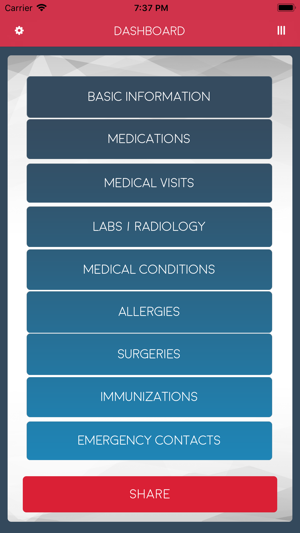 Key of Life allows patients to store, update, and organize all of their EHR and EMR on their mobile device. A leading feature of Key of Life is the in-app purchase option that allows users to share patient profiles between family, physicians, specialists, first responders, or anyone else prior to attending their medical appointments. Patients can store their records via text or photo; and easily update, manage, and share. Using the Key of Life sharing feature, gives patients’ family members, caregivers, and others access to their loved ones recent and past medical updates. Key Of Life 1.3 is Free (With In-App Purchases) and available worldwide through the App Store in the Health & Fitness category. There is also an Android version available on Google Play. For more information, download the app or visit the official website. Founded by Chad and Leiah Anfinson, a leading doctor in Fleming Island, Florida, Key of Life App, LLC is the newest global leader in medical mobile applications. All Material and Software (C) Copyright 2019 Key of Life App, LLC. All Rights Reserved. Apple, the Apple logo, iPhone, iPod and iPad are registered trademarks of Apple Inc. in the U.S. and/or other countries. Other trademarks and registered trademarks may be the property of their respective owners.